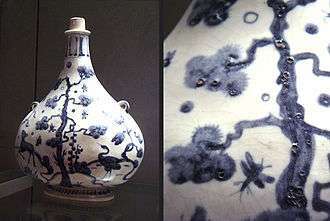 Medici Porcelain Works, Bottle, c. 1575–87, with pitted texture detail; Soft Paste Porcelain; OA 2734, Musée du Louvre, Paris. 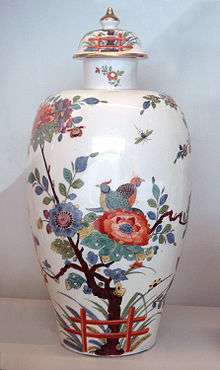 Medici porcelain was the first successful attempt in Europe to make imitations of Chinese porcelain. The experimental manufactory housed in the Casino of San Marco in Florence existed between 1575 and 1587 under the patronage of Francesco I de' Medici, Grand Duke of Tuscany. 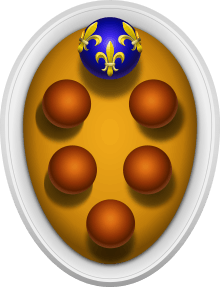 A painted mark of Brunelleschi's dome and a capital letter F appear on the underside of some pieces; others bear the Medici palle, the balls that are the Medici heraldic charge. 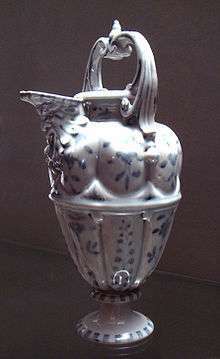 Never a commercial venture, Medici porcelains were sometimes given as diplomatic gifts; for example, surviving pieces bear the arms of Philip II of Spain. However, the entire project was ultimately relatively short-lived; the high-firing temperature pushed sixteenth century technical capability to its limit, resulting in exorbitant production costs. There are no references to Medici porcelain manufacture securely dated after Francesco's death in 1587. The body of Medici porcelain ware is a type of soft-paste porcelain, composed of white clay containing powdered feldspar, calcium phosphate and wollastonite (CaSiO3), with quartz. The glaze contains calcium phosphate, indicating that the middle-eastern technique of using calcined bone to make an opaque white glaze was adopted. The result is translucent but slightly glassy in feel. 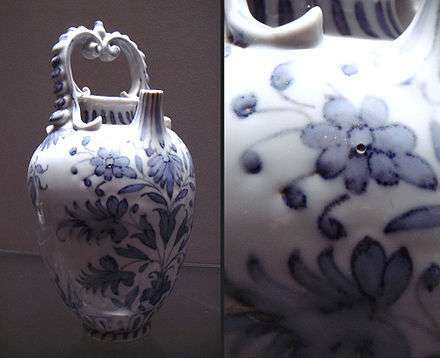 Following the precedents of classic Chinese blue and white porcelain, decorations were painted in underglaze blue, which resulted in a range of hues when fired—from a bright cobalt blue (such as a flask in the National Gallery of Art) to grey (such as the bottle detail at right). Some pieces have outlines traced in manganese. Body shapes are adapted from maiolica ceramics and silver models; they range from the largest basins and ewers, chargers and plates, to the smallest cruets. 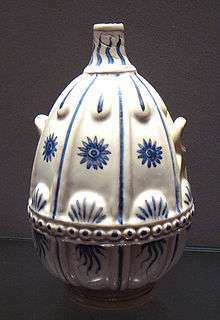 Decorative motifs are executed in imitation of Chinese blue-and-white wares, or of Turkish İznik ceramics, or more rarely in imitation of maiolica grottesche ornament. 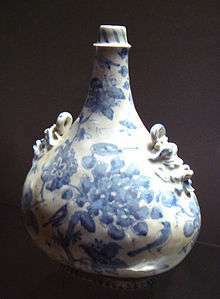 Both Chinese and Turkish ceramics had been represented in the Medici family collections for over a century; for example, one prized possession of the family was a gift from the Mamluk Sultan of Egypt who sent Lorenzo de' Medici "large vessels of porcelain, the like of which has never been seen" in 1478. Medici porcelain gourd, with pitted texture detail, 1575-1587. When Francesco died, his younger brother Cardinal Ferdinando de' Medici inherited the position of Grand Duke. Ferdinando brought his prized Chinese and Medici porcelains back with him to Florence from the Villa Medici in Rome, along with his paintings and treasured Roman antiquities. But with the ubiquity of European soft-paste and hard-paste porcelains in the eighteenth century, the Medici heirs in the House of Lorraine came to value less and less the imperfect Medici porcelains, with their minute firing cracks and bubbled glazes. In 1772 an auction in the Palazzo Vecchio of objects from storage dispersed the Medici porcelains conserved in Tuscany. The venture disappeared from history until interest revived after the mid-nineteenth century. The 1588 inventory drawn up after Francesco's death listed 310 pieces. Today only some sixty or seventy pieces are known to survive. The next successful European attempt to make soft-paste porcelain would come from the Rouen manufactory in France, in 1673. ↑ Marco Spallanzani, Ceramiche alla Corte dei Medici nel Cinquecento, (Pisa: Scuola Normale Superiore, and Modena: Franco Cosimo Panini, 1994), p. 69. ↑ Cristina Acidini Luchinat, The Medici, Michelangelo, and the Art of Late Renaissance Florence exhibition catalogue, Florence, 2002, cat. nos 101-05, pp 247ff. ↑ Cristina Acidini Luchinat, p. 248. ↑ According to on-site Raman spectroscopic analyses performed at the Musée National de Céramique, Sèvres, reported in Ph. Colomban, V. Milande, H. Lucas, "On-site Raman analysis of Medici porcelain", Journal of Raman Spectroscopy, 35.1 (2003:68-72). ↑ A single piece decorated in green and yellow is at Brunswick and another conserved in a private collection. ↑ Marco Spallanzani, "Medici Porcelain in the Collection of the Last Grand-Duke" The Burlington Magazine 132 No. 1046 (May 1990, pp. 316-320) p. 317. ↑ For a list of surviving pieces of Medici Porcelain see G. Cora and A. Fanfani, La porcellana dei Medici (Milan) 1986. G. Cora and A. Fanfani, La porcellana dei Medici (Milan) 1986. Giuseppe Liverani, Catalogo delle porcellane dei Medici, in series Piccola Biblioteca del Museo delle Ceramiche in Faenza: II (Faenza) 1936. Arthur Lane, Italian Porcelain London 1954.